Trough planter boxes can add a number of functional and aesthetic elements to your indoor and outdoor designs. 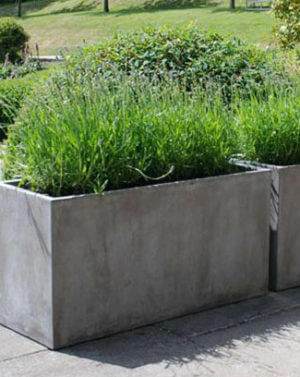 We normally see these rectangular shaped planters lining up the sides and corners of buildings and streets. To give you a few ideas, we list down some ways you can use trough planters in your design project. Planter boxes can add greenery to an urban area without having to dig up pavement and can be good alternatives to fencing. Because of their rectangle shape and ability to create a barrier, trough planters are useful in open spaces to guide pedestrian traffic. Choose trough planters that can withstand damage from traffic and outdoor weather conditions. Planters made from granite are especially durable. You can see trough planters used in the streets of Queen’s Quay in Derry City as a barrier for pedestrians. At the same time, the planters allow for planting perennials in a bustling cityscape. These granite planters are durable enough to withstand some punishment from pedestrians and small trolleys. At Fenwicks Marina in Brooklyn, New South Wales, troughs and tapers help define space and provide privacy for those dining on the wooden decking. Having plants nearby just makes the experience more relaxing. This car park building in Bankstown in Sydney is given a soft touch with the added greenery. What was once a concrete complex, hard on the eyes, is now just a tad better with the addition of some hardy plants. At Stanhope Village Shopping Centre, plants trough planters were added to help reduce carbon intensity. It also doubles as a border between the parking area and the walkway. Granite trough planters were also chosen to create a green area in a space filled with hard lines at Westpac in Cavill Avenue. The addition of the planters makes the area a bit more pleasing to the eye. At Greenway Supa Centre in Wetherill Park, trough planters were added so that shoppers won’t walk or get injured underneath the metal staircase. Trough planters are effective means of directing traffic due to its shape. Trough planters also helped direct traffic by lining up the entryway of the Colin Bell Stand at the Manchester Football Stadium. Trough planters can be used to add structure, create division, and decorate residential design. Let’s take a look at some examples on how you can use trough planters in residential design. Granite trough planters planted with ornamental plants were used as a border at the end of the terrace in Burwood Park in Walton-on-Thames, England. Granite is a durable material so it can withstand harsh weather conditions without sustaining damage. It may get dirty but just a quick polish and it’ll be good as new. Slate trough planters blended well with a backdrop of natural colours at a terrace redesign in Drummoyne, NSW. The trough planters act as a safety barrier to prevent people from reaching over to the trees which can lead to accidents. Natural slate trough planters also act as a barrier at a private residence in Rose Bay in Sydney. The slate planters grace the edges of the rooftop to help avert accidents. A total of 72 slate planters were used for this project. Lightweight concrete trough planters planted with low shrubs hug the walls and provided a soft planting solution at a poolside project in Brisbane. The trough shape makes trough planters ideal for linear planting. The trough planters were also used in conjunction with tapers for planting taller plants. In this setting, the lightweight concrete planters also match with the colours in the pool design. Do you have any other ideas on how to effectively use trough planters in design? Let us know in the comments.